Everything I’m writing about this week should be considered my pick of the week. They’re all so terrific I couldn’t choose just one of them. This is a wonderful time to be a comics fan. Nadia Pym is The Unstoppable Wasp [Marvel; $3.99 per issue]. She’s the daughter of Hank Pym and Maria Trovaya, his first wife. During the Cold War, Trovaya was kidnapped and killed by Russian agents. What we now know – besides the Cold War continuing to this day with Russia interfering in our elections and being ruled by a murderous dictator – is Maria lived long enough to give birth to a daughter of whom the kinda dead for now Pym was unaware. I’m simultaneously appalled and impressed by this continuity implant. Nadia was raised in the same Red Room program in which Black Widow was trained. Getting hold of a Pym Particle – what allows Ant-Man and others to change their size – she escaped and came to America. I’m hearing Neil Diamond right now, are you? Nadia is brilliant and so full of determination and wonder that I can’t help but love her. The Red Room clearly couldn’t lay a glove on her. She has helped the Avengers and other heroes. She has the blessing of and is helped by Janet Van Dyne, the original Wasp. She’s being guided by Edwin Jarvis, once voted the 25th best Avenger and who I would rank higher on that list. She has used her abilities and considerable inheritance to form G.I.R.L. – Genius in (action) Research Labs – and recruit gifted young women to do their scientific research in a female-friendly atmosphere. She’s become friends with Mockingbird, Moon Girl, Ms. Marvel, me and any comics readers who love positive super-heroes whose comic books make them feel all happy inside. Writer Jeremy Whitley is the creator of Princeless, a comics series about a courageous and smart princess who refuses to abide by the stereotypes to which society would hold her. It has been nominated for two Eisner Awards – Best Single Issue and Best Comic for Kids Ages 8-12 – and five Glyph Awards, winning three of the latter in the categories of Best Female Character, Best Writer and Story of the Year. He and Nadia deserve to win more awards because his work on The Unstoppable Wasp is downright transformative. Issue after issue, artist Elsa Charretier delivers clear, exciting storytelling in a pleasing spritely style that conveys action and emotion with equal aplomb. I don’t use the word “spritely” lightly. Her art is magical. Praise must also go to color artist Megan Wilson, who casts scene after scene in vibrant hues that support the stories, and editors Alanna Smith and Tom Brevoort for what they do to facilitate this most remarkable comics series. I’ll be shocked if The Unstoppable Wasp doesn’t get nominated for and win a whole bunch of comic-book awards next year. 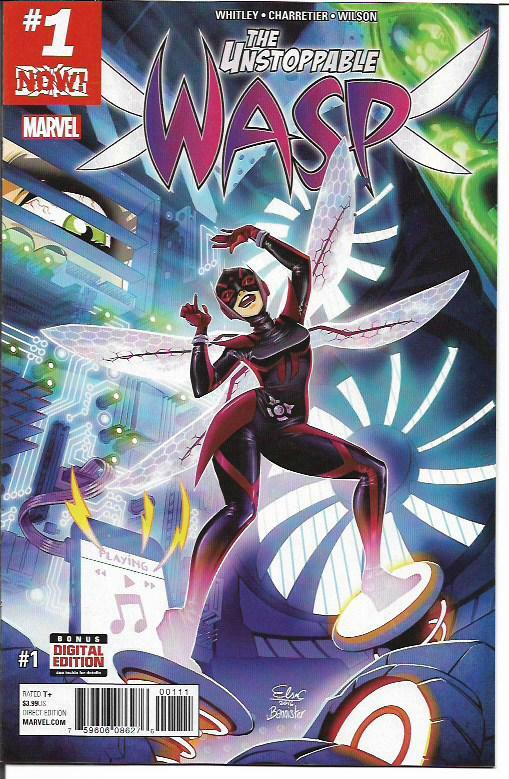 The Unstoppable Wasp Vol. 1: Unstoppable! [$12.99] will be coming out in September. The trade paperback will collect the first four issues of the title and Nadia’s earlier appearance in All-New, All-Different Avengers #14. I recommend this book to comics readers of all ages, and to public and school libraries. 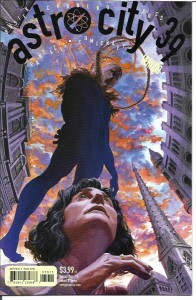 In this year’s Eisner nominations, Astro City by Kurt Busiek and Brent Anderson [Vertigo/DC] is up for Best Continuing Series and my pal Kurt is up for Best Writer. Both should win. Astro City sets the standard for consistent high quality in issue after issue. I tend to read comics series in batches and recently read issues #37-43 [$3.99]. The high quality has become a given for this series, but I am equally impressed by the variety of stories to be told in this universe. We get stories of heroes (and a heroine) defined by their eras and the rebellious attitudes and music of those eras. There’s not even a slight doubt in my mind that I would buy ongoing series starring Mister Cakewalk or Jazzbaby. But that’s not Astro City’s style. It is an anthology series that always satisfying while always leaving me wanting more. We get stories about a human woman – a lawyer – who lives in Astro City’s spooky Shadow Hill neighborhood. She ends up representing a magic-based super-heroine before a tribunal of supernatural beings. We meet the super-hero the city was named for and a super-villain who has been stranded on an island for years. We get some wondrous background on the Gentleman, one of my favorite of the Astro City heroes. All of these stories are entertaining, poignant with great art and storytelling. I think even the most jaded super-hero fan in the world would be filled with delight reading Astro City. Astro City Vol. 15: Everyday Heroes [$24.99] is the most recent of the Astro City hardcovers. It collects issues #37-41. I recommend it to any reader who loves super-hero comic books and comic books in general. 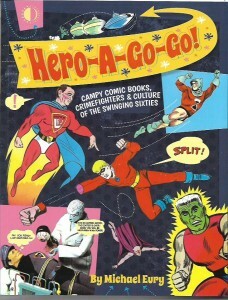 I’m only about 50 pages into the 272-page Hero-A-Go-Go: Campy Comic Books, Crimefighters, & Culture of the Swinging Sixties by Michael Eury [TwoMorrows; $36.95] and yet, here I am, deeming it worthy of pick-of-the-week status and recommending it to you. Sure, I suppose I could have sped my way through the entire book. But the pages I have read were enough to convince me this is a tome to be enjoyed at a leisurely pace. Eury is a comics fanatic and the editor of the esteemed Back Issue magazine. In this book, he weaves a symphony of “camp” comic books and popular culture, bounding from riff to riff as he explores the likes of Magicman, Nemesis, Metamorpho, Captain Action, the super-heroic versions of Dracula, Frankenstein, and the Werewolf, Captain Klutz, Herbie, Super-Hip, aspects of Batman and Batmania and much more. It’s a book filled with essays, histories and interviews with Bill Mumy, Ralph Bakshi, Dean Torrence (of Jan and Dean), Ramona Fradon and other Sixties legends. I’m taking my time reading this treasure trove of fun facts, but I have the sacred responsibility – it’s the Code of the Tipster – to alert you to the book sooner rather than later. Recommended it to local and school libraries. Purchase a copy for yourself. Purchase a copy for your best comics-reading pal. You will be glad you did. Now excuse me while I read about Jerry Lewis and Super-Goof.